The group gathered at the masjid on Sunday night to express solidarity and support for the Muslim community following the death of 50 people gunned down at two mosques in New Zealand’s city of Christchurch on March 15. Similar vigils have been happening across the country. ‘Thank you,’ Amir told the crowd in conclusion of his speech. The event, sponsored by the Billerica Interfaith Association, included words of love and support from all faiths. ‘It is wonderful to gather here as neighbors, to gather here in love and to show support for one another,’ said Reverend Katherine Adams, of First Congregational Church in Billerica. 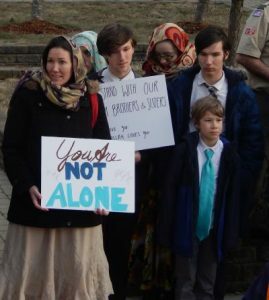 After addressing the crowd, Rabbi Shoshana Perry, of Congregation Shalom in Chelmsford, handed a pile of letters, written by the children of her congregation, to a young boy to share with other children of the Billerica masjid. ‘We care about you and want you to grow up in a nation that respects you and loves you and celebrates who you are,’ Perry said. Before attendees gathered inside the masjid, the massive group stood outside the place of worship, sharing flames to light the candles they held. Billerica resident Zahir Adil, a member of the Board of the Islamic Counsel of New England, pointed out he’s attended a few of the many vigils that have popped up in communities across Massachusetts. ‘Any shooting like this in any place of worship-whether it be a synagogue, a church, a temple-it is just sad because the purpose of a person being there is to be safe and to worship,’ added Fatema Esmail, a member of the Boston Dawoodi Bohra Community, which includes the Anjuman-e-Ezzi Masjid.